We understand it can be hard to find the time to call your doctor’s office, schedule an appointment or get a prescription refilled. One of the many benefits of having a My Health at Vanderbilt account is how easy that is to do from your computer, wherever you are. 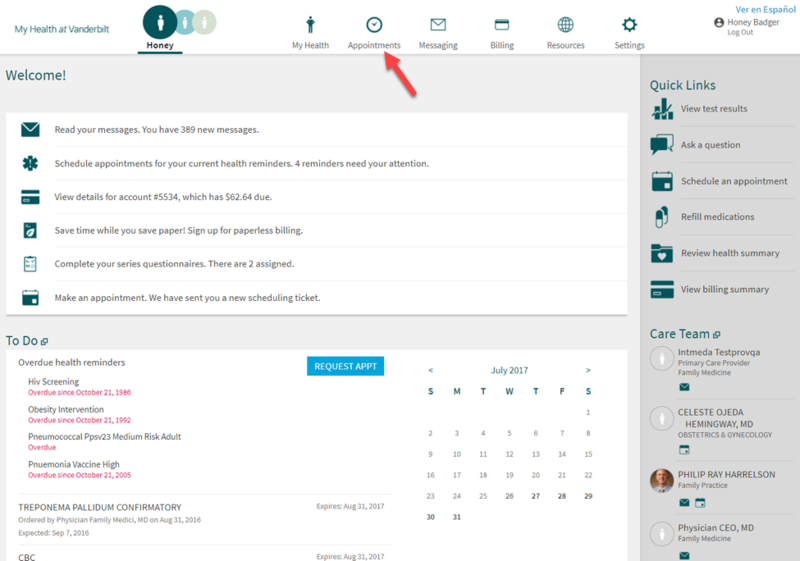 To check your upcoming appointments or look at details from past appointments, click "Appointments" from the top menu of your My Health account. There's now a new way to get an earlier, more convenient time for your next appointment if one becomes available. It's called Fast Pass. Learn more here. How to schedule or request a follow-up appointment? How to schedule or request an appointment with a new doctor? How to request a medicine renewal or refill? How to check-in online for an upcoming appointment (eCheckin)? How do I join a waitlist for an earlier appointment?